This little alien monster is ready to shred and tear your brain out. But wait at the same time, the little monster can be tuned to play sweet soulful blues or rock driving piercing roll. 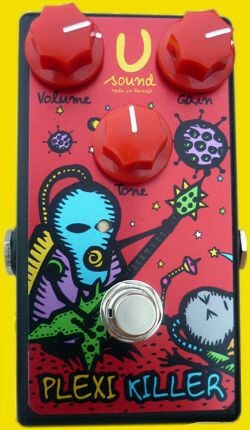 The "Plexi Killer" pedal is assembled using a field-effect transistor (FET), has NO inside chips, or clipping diodes and is assembled with the highest quality components. All this adds up to what truly makes a difference when achieving the outstanding level of tonal sounds the monster pedal can unleash! When jamming on this pedal through my Fender Hot Rod or my clean Savage amp I can compare the clear drive of this pedal to my 100 watt Marshall '68 plexi and can hear a lot of the same clear harmonic similarities. It is amazing what goes into these pedals and then again what’s amazing is what’s achieved coming out. 9 V battery or 9Volt, negative center pin power supply.